PROSPECT PARK (WABC) -- Two red panda cubs, one male and one female, were born at the Wildlife Conservation Society's Prospect Park Zoo this summer and have made their public debut. 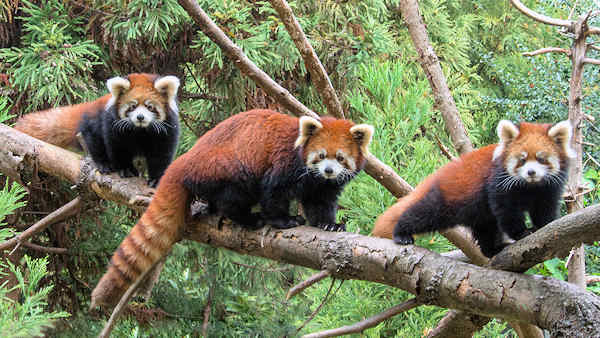 The Wildlife Conservation Society has a successful history breeding red pandas at the Bronx, Central Park and Prospect Park zoos as part of the Species Survival Plan, a cooperative breeding program administered by the Association of Zoos and Aquariums designed to enhance the genetic viability and demographic stability of animal populations in accredited zoos. The red pandas at the Prospect Park Zoo are a subspecies from the eastern portion of the Himalayas. Red panda cubs are born with a very soft, plush light brown coat that eventually becomes more coarse. They reach adulthood at around 18 months. Adult red pandas have reddish-brown and black coats. They have an adaptation on their wrists that acts much like a thumb and enables them to grasp food items like bamboo as well as tree branches. Red pandas are listed as "vulnerable" by the International Union of Conservation of Nature (IUCN) due to habitat loss caused by deforestation for timber, fuel and agricultural use. Their population is declining. The Wildlife Conservation Society works in China and Myanmar to save red pandas and other Asian wildlife.